Would You Get a SCT? I’ve been debating for some time whether or not to invest in a 8 inch SCT, such as a Celestron Evolution, to go with my Z12 dob and SW 120 ED Pro Refractor. Or would it simply be more of a waste of resources considering what I already have? I am strictly a visual observer and observe from my back deck at home. I’ve never owned a SCT before and I have read all the pros and cons about them. Still I wonder. Should I or not??? Decisions—-decisions! Moved to the Nexstar Forum, for better fit of topic. Attend a star party or two a try one out, and compare it to your Z12 set up nearby. Its always better to try before you buy. I think you'll find the views through the 8" to be quite a bit dimmer and the field of view narrower with the same eyepieces than the Z12. The only advantage would be a drive and GOTO. At first glance, I'd stick with what you've got. Assuming your mirrors are good, the Z12 should out perform the Evo in every way, except goto. If you don't already have goto for your refractor, you can make that happen. That SW seems a lot more flexible and easy to cool down than an 8" SCT? What's your motivation for the Evo? Woof, tough question. Your current scopes bracket the 8" SCT pretty well. My first thought about advantage of an SCT would be more about small tube length and easier equatorial tracking if viewing planets or other small objects in the dob was frustrating because they drifted out of view too quickly. Portability is arguably better as well but if you are able to view from your back deck that may not be too valuable either. 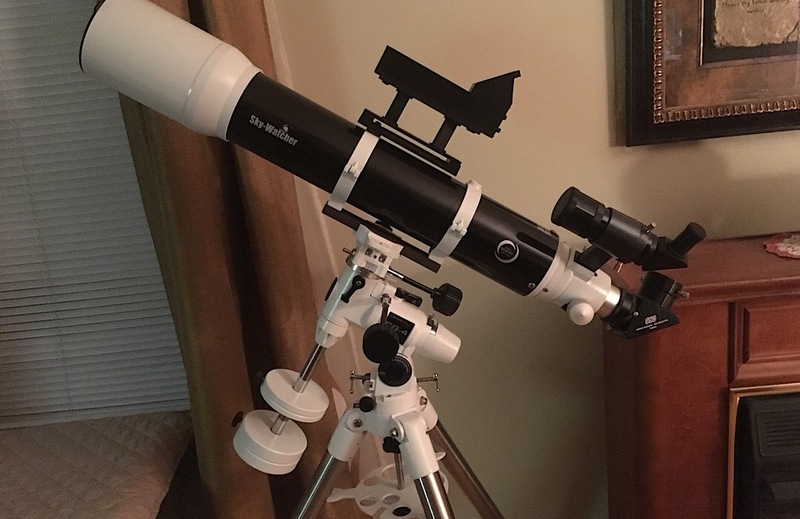 I've compared my 8" f/5 Newtonian to a StellarVue refractor, either the 102 or 115. Somewhere in there. We were at a club Star Party. My image was brighter, his was a lot clearer. Splitting the Double Double in Lyra was easy on his, but took some imagination on mine. To be fair, my scope probably could have used a bit of collimation, and it was before I had invested in a coma corrector, but I still think the StellarVue was the better visual scope. So unless you go with a much bigger SCT (maybe an 11"? ), I don't think you're gaining anything over what you already have. SCTs are not as bright as Dobs (usually 2x the F/ratio). GoTo is probably the big win, though by now I bet you're pretty adept at star-hopping with the Z12. Just a thought, perhaps you might expand in a different way, by trying EAA (electronically assisted astronomy)? Assuming the ES 120 is on a good GEM tracking mount, get a good camera and do some live stacking. Longer integration can bring out images and details you can't quite see visually. I hope you realize that you actually lift the OTA onto the mount or wedge and SCT OTA's can be heavy. Then, at the end of the observing session you have to carefully lift it off and place in into the carrying case. And guess what happens if it slips...oops. I realize an 8-inch weighs less than a 10-inch, but it's still heavy and you have to be careful! BTW, that round piece of glass in the front does a lot more than just hold the secondary mirror and the are expensive and a pain in the a** to replace. Other than that, they are great, wonderful, beautiful and the greatest Telescopes ever to grace the observing fields of the greatest planet ever!!!!! P.S. Just kidding....there are plenty of better planets than Earth! LOL! An Edge 8 OTA weighs about 12lb. It's a great combo of aperture, sharp optics, and compact size. If you look at the planetary imagers you'll see that many are using SCTs. My Edge 8 has superb optics. The Z12 can see so much more for visual use that you are likely be somewhat disappointed by an 8 inch SCT. On the other hand, other factors may outweigh the difference. An 8 inch SCT on an alt-az mount like the Evolution is extremely portable. Much easier to handle than even your SW 120. You would probably find yourself inclined to grab an 8" Evolution before either of your current scopes due to its favorable ratio of convenience to optical power. Another consideration: it is easier to collimate an SCT than your Z12 and an SCT holds collimation much longer (indefinitely if you do it right). Then you probably want to think about GoTo and tracking. You didn't mention the mount you use for your SW 120, but if you haven't owned a GoTo mount, consider the following. Do your current viewing habits bring you back to just a relatively small number of objects which you can find easily? If so, you will probably enjoy the much larger pool of objects you will be able to easily observe. On the other hand, if a large part of your enjoyment of the hobby is hunting down and locating objects, you will loose that (although you could still star hop, just using the motors to provide manual slewing - pretty expensive way to get motorized slewing though). If you like to observe an object for several minutes at high magnification, the built-in tracking of a mount like the Evolution is definitely a plus. Last note - you can successfully use the SW 120 on the Evolution mount to add GoTo and tracking. Just be sure to set up the Slew Limits accordingly to minimize the possibility of a collision of the optical tube and mount. I have a 12.5" dob, a 6" Nexstar and a 90mm Apo refractor, and realized I have one scope too many. My decision is to sell the refractor, even though I adore the pinpoint stars I see in it. I realized that nothing beats the views of the 12.5" dob, so my second scope needs to give me the convenience the bigger dob lacks. The Nexstar is fast to set up, has go-to, and can even be controlled through my iPad. It also has better resolving power and is lighter than my refractor. All that is to say, consider getting the Evolution and selling the refractor if it makes sense for you. I'd even think about getting the 6" over the 8" if the 8" isn't 'grab and go' enough for you..
My experience is mostly manual star hopping, both with a 8 inch Dob and an Orange Tube C8. However, I have been pleasantly surprised and delighted by my new Evolution 8 scope. It is much more portable than a Dob. The OTA, Mount, and Tripod are three seperate light weight pieces (I have to carry my gear down stairs). Set-up is very easy. The Evo tracks. Most importantly, the go-to finds faint objects in light polluted skies that I would never find star hopping. It also excels at objects directly overhead. It's hard to answer this question without knowing why you want an SCT. It sounds like you already have 2 very good telescopes. Why aren't you happy with them? If it's because you want go-to or the Z12 is too heavy for you, those are two good reasons. Otherwise I can't see what a Nexstar will do for you that your current telescopes can't already. I love my C-8/E on the Ioptron AZ Mount Pro. Its was my perfect outreach/G&G set up. Fits in nicely between my dob and 80mm Daystar. I just this month relocated the set up to S AZ where my parents live and I visit frequently. Outstanding views down here of course. Wish I could have moved my dob down here and left the C-8 up north. What would you hope to gain from an SCT that you don't receive from your current scopes? You are talking about a step-down in aperture. An 8" SCT is F/10 - 200mm @ ~2000mm. This allows far better resolution @ any given eyepiece with marginal loss of contrast with a well acclimated and collimated SCT when compared to the 120ED. It will pull in more DSOs than the 120 tracking them on the EVO which you can't on a manual Dob. The fork mounted 8" is a quick and easy setup compared to either refractor or 12" Dob. 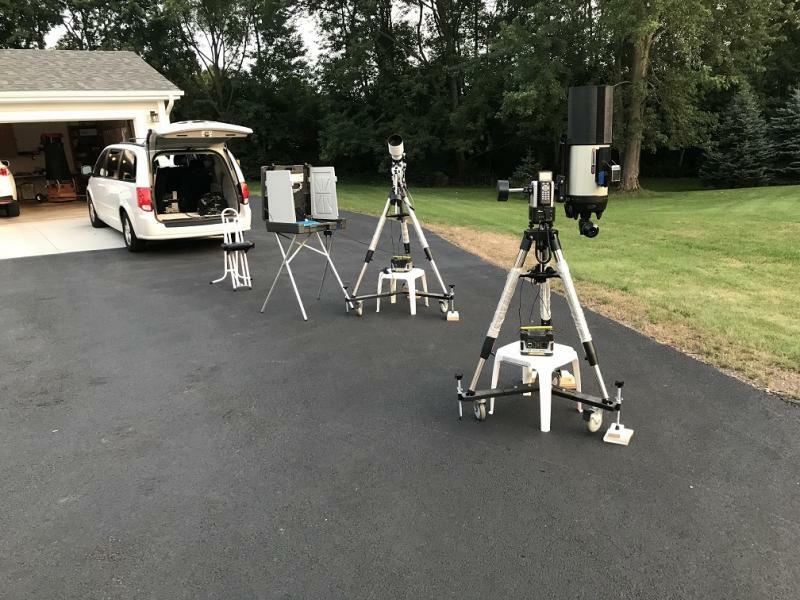 An Evolution or LX65 Meade take only a few steps to assemble and assembly weight is less than the Dob or multiple steps and final weight of the 120 refractor on even an EQ5. Unless you opt for a big SCT or an LX200 fork the weights you deal with are around 50lbs for the ASSEMBLED tripod and mount. 8" OTAs are about 11lbs, Evolution mount is 15lb, tripod is the rest of the weight... maybe 22lbs. The quick setup of an Evolution or any fork mount means you're not dickering around with counterbalances, polar alignments, etc. And you're not having to haul a 55lb base and another 40lb newtonian tube and spend minutes checking collimation. Perhaps my most favorite advantage of an SCT on a fork or single arm Evolution? you can choose a stool at a comfortable height and not have to worry about stooping low for objects at zenith or opposite sides of the meridian. The single arm mount has an advantage over a fork arm in that the eyepiece can remain in easy access if it's canted to the side when changing from horizon to zenith. That's why an Evolution or LX65 is on my list to buy in the future for quick visual setup and use even though I have THREE fork arm telescopes. Thanks for all the input! I guess I am looking at the go-to factor more than anything else. I have the SW 120 on a CG-4 manual mount. Have had the SW for a couple of years and the Z12 since 2009. Both very good scopes. I will ponder on this a while longer. I may look at the possibility of putting the SW 120 on a go-to Mount such as the iOptron AZ Pro or similar in the future. Was just doing some thinking. Thanks again! If you got the AZ-EQ6 you could dual mount the 120 and an 8" SCT on opposite sides. That is why I asked what you hoped to gain from an SCT. Turns out it is not the SCT you want, it is a GoTo mount. the 120 on a GoTo mount sounds great. You can put any kind of an optical tube on a GoTo mount. It all depends on what you are trying to accomplish. But why not a 12" GoTo Dob, if you want the aperture and GoTo? An Orion XT10G Goto Dob is $1500 for 2" more aperture for $200 less. An Orion XX12 Intelliscope is $1600 for 4" more aperture for $100. an Orion XX12G Truss GoTo Dob is $2100 for 4" more inches of aperture for $400 more. So, it all comes down to what you are trying to accomplish. Can you store it on ground level, in a garage or shed? Put the dob on a hand truck and just roll it out when you want to use it. I have my XT8i on a cart. Looking at a 12" which I will match up to a hand truck. @aeajr: I could roll the Z12 out my kitchen door onto the back deck with a two wheel dolly. Most of the time I just take it out in two sections. Base then OTA. Well, perhaps for the same logical reasons that I have one! I have a 12" GoTo Dob, which can be wheeled straight out onto my deck. Or, it can be wheeled down a ramp over my front steps, if I want better views of the south. This is a bit tricky, of course. I have a Nexstar-11 GPS that permanently sits on a corner of the deck, all year round. The Tube is wrapped in insulation, so it is ready to provide excellent views the minute I remove it's Telegizmos 365 Cover, and plug it in and do a quick 2-Star alignment. I also have a 6" Dob as my Grab -N-Go, my only non Go-To scope. And, then, there is my Evo-8!! It, too, and it's Dew Shield, are wrapped in Reflectix for perfect views no matter when I take it out from my 68F house, no matter the Temperature outside. 3 sides of the property are Farmland, the skies are Bortle-4, with Bortle-3 about 2 minutes away. But, along with the C11, it is my Most Used Scope, simply because I can use it ANYWHERE on the property, or easily drive it somewhere. The views in the 12" and 11" are better, of course, WHEN(!) Seeing Permits! Sometimes those bigger mirrors show a lot of undesirable things that detract from the views. The 8" hits a sweet-spot in aperture (amazing under dark skies! ), Portability (I can move it to where EVER on the property where the views are best! ), Non-"Fussiness" about Eyepieces since it's f/10; can easily be converted to f/6.3 for wider, bright views, and has a gazillion available accessories. And, the Optics on THIS psrticular example are truly flawless! So, you want to know why Ed?? THAT'S Why! Edited by Bean614, 22 March 2019 - 09:44 PM. As a Newt and particularly a Dob user for many decades, no way would I EVER get an SCT. Period. I've looked through plenty and sorry, no ceegar. Good to know that is why you like an 8" SCT. Well stated for your situation. However, that doesn't seem to be Gary Riley's situation or goal. Turns out his desire was for a GoTo mount rather than an SCT. Apparently, he closely associates SCTs with GoTo mounts. But any OTA type can be put on a GoTo mount. Unless you want to replace that Z12 with a GoTo 12" I think that 120mm refractor on a GoTo mount sounds pretty good. On a GoTo AltAz mount, it will still light enough to be fairly portable for around the yard or in the car. If you want to get into AP then I would make it a GoTo EQ mount. You can start with the 120 mm. Later, if you get more serious with AP, you will likely add an 80 mm F5 APO on the same EQ mount. It all depends on your plans for now and for the future. And as you can see from my sig, I have one. It isn't that I don't like the scope, it is a very nice SCT, I've had it out on nights where 300x was SHARP on planets. Actually some of the best views I've had with planets is with that scope. The issue is the hassle factor. It just takes a lot more time and effort on both ends of the observing session to use it. It all goes out in 3 trips or so, then you have to go through the setting up the mount, point N, find Polaris through the sight hole (no polar scope) using the adjustment screws getting it just so, set up all the dew control stuff, the dew shield the heater strips, the controller the power pack, Whew! are we done yet? Nope! Not if you want goto, now you have to go through the alignment process, hope it takes. It didn't, let's do it again. Hope it works, maybe it did this time, but ding dangit I can get the 12.5 out the door (with a hand truck) and set up in two minutes flat. Add another minute to get the observing table out of the shop. I have three Dobs, an 8-inch SCT, and a 90mm Mak, all of which I use for visual observing, although I mainly image with the SCT and the Mak I use as a spotting scope and to observe the Sun. SCT's and Maks work very well for visual observing, as long as you remember they are not the telescopes you want if very wide fields of view at low power are what you are looking for. The optical design and the baffle tube sets a limit to the maximum true field of view possible with these telescopes. As long as that is kept in mind, they excel on Solar System and most deep sky objects. The ones they don't are better seen in large binoculars, small, low power telescopes or very large Dobs. You won't be looking for 15th magnitude galaxies with an 8-inch SCT anyway.